prepaid type e-money "Rakuten Edy" | What is Rakuten Edy? 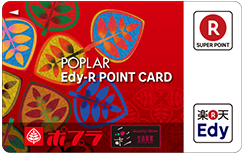 "Rakuten Edy" is a prepaid type e-money which can be used at over 400,000 member stores in Japan. By simply touching your Edy card onto the reader, you will hear jingling coins sound as a sign of payment completion. Have your Edy card at our member stores. You can buy your Edy card from the merchants below. Each Edy cards are differently priced according to the merchants. Store value to your Edy card. When you get a Edy card, there is no value in it. Please ask the cashier to charge your card. You can top up value from 1,000yen to 50,000yen at the merchants below. Enjoy shopping with e-money "Rakuten Edy" at over 390,000 member stores in Japan! 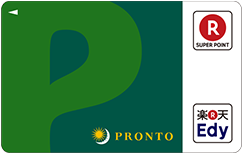 You can use your card again and again by topping it up. - Stored value is non-refundable. - In case of lost or stolen, stored value is non-refundable. - In case of broken, contact the issuer printed on the back of your Edy card. - Please refer to our TERMS & POLICIES before using Rakuten Edy Services. "Rakuten Edy" is a prepaid type e-money operated by Rakuten Edy, Inc.